Welcome to The Abso!ute Sound online! We explore music and the reproduction of music in the home. We believe that the sound of music, unamplified, occurring in a real space is a philosophic absolute against which we may judge the performance of devices designed to reproduce music. Our goal is to provide the resources consumers need to judge how a component's sound either honors or departs from the music's truth, and to make sound purchasing decisions that maximize their experience of reproduced sound. Below is our Issue 163, August 2006 table of contents and editorial. Can any two-way mini-monitor be worth $22,000? Designer Alon Wolf’s MAGICO Mini poses the question, and Jonathan Valin has the answer. 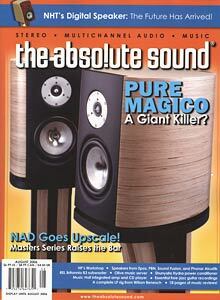 Chris Martens reports on the latest version of the speaker that won TAS’ Budget Loudspeaker of the Year award in 2003. Chris Martens on a carbon-fiber tonearm and turntable from Great Britain. …while Sallie Reynolds tries out another affordable integrated and CD player from Great Britain’s Music Hall. Robert Harley reports on a power conditioner that is expensive but worth it. Neil Gader on a small sub with high-end credentials. A sweet-sounding German import that gets a “five heart” rating from Sue Kraft. Barry Willis auditions an ambitious three-way floorstander from PBN. The futureis now, says Robert E. Greene, with NHT’s ingenious digital loudspeakers. Jacob Heilbrunn on a two-way, ribbon/cone hybrid that speaks the unvarnished truth. Derk Richardson introduces you to the world of improvisational jazz guitar — and recommends the best free-jazz guitar recordings. Reviews of the latest CDs and LPs from Neil Young, Dixie Chicks, Pearl Jam, Scott Walker, Mission of Burma, The Raconteurs, Paul Simon, Mark Knopfler, Bruce Springsteen, Morrissey, Mono, and Del McCoury. The Florestan Trio’s take on Saint-Saëns’ Piano Trios, György Kurtág’s Kafka-Fragmente, a pair of Purcell titles, Edgar Meyer, and Anna Caterina Antonacci, plus reviews of three more discs and two multichannel SACDs. The latest from Ben Allison, Liberty Ellman, Cassandra Wilson, Fred Anderson, plus an overlooked treasure from Ella Fitzgerald on LP. Randy Tomlinson on designer Jim Bongiorno and the transistor amp that changed a lot of minds about solid-state.